In planning Mourning a President, an exhibit about the funeral of John F. Kennedy, it was fitting that an American flag was selected as a key focal point. Prominently displayed is the flag that flew over the U.S. Senate during the period of mourning following the assassination of President Kennedy. This is the first time that this 15- by 10-foot flag, which is part of the Museum’s vast collection, has been on view fully unfurled since 1963. The U.S. Senate wing flag is displayed on the seventh floor of The Sixth Floor Museum at Dealey Plaza. 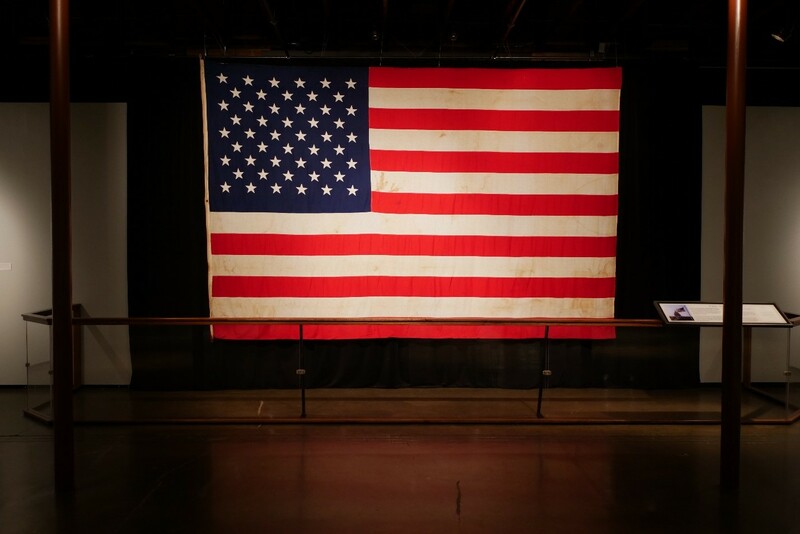 The largest and most striking object in the temporary exhibit, this flag was hoisted above the Senate wing of the U.S. Capitol building on November 7, 1963 as a matter of routine. When news of the assassination of President John F. Kennedy reached Washington, D.C. on November 22, the flag was lowered to half-staff, and it remained that way until it was lowered on December 22, at the close of the official month of mourning. While this flag did not play a formal role in the funeral, it was a prominent symbol of the nation’s grief on the grounds of the U.S. Capitol. When installing a historic artifact for public viewing, the desire is to make an object as accessible as possible while protecting it from damage – be it from environmental elements such as light or from risks associated with the display methods. The flag provided a unique challenge, due to both its size and age. It was important that the manner of hanging the flag in the exhibit comply with advisory rules for display and care of the U.S. flag set out in the United States Flag Code, while at the same time ensuring the safety and long-term preservation of the flag as a museum artifact. Mounted from a custom-made rod and sleeve that both support the flag’s structure and allow it to extend freely from the top, the fully unfurled flag provides a striking centerpiece to the exhibit. Museum visitors are able to view and appreciate the flag in its entirety, while its safety and preservation needs are addressed by controlled lighting and a barrier rail. 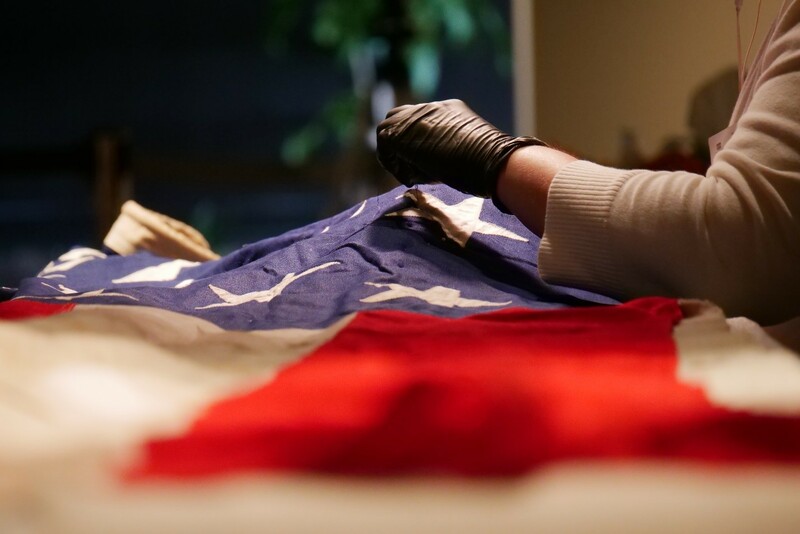 When the exhibit closes, the flag will be cleaned and carefully stored using archival-grade materials, preserved for future generations as an important symbol of the death of one of this great nation’s most revered leaders. The U.S. Senate Wing Flag will be on display as part of the Mourning a President exhibit until February 19, 2018. Author’s Note: In 1954, President Eisenhower issued Proclamation 3044, which established federal guidelines for the display of flags at half-staff for national leaders and other officials as a mark of respect to their memory. The proclamation specified that upon the death of a president or former president, the flag must remain at half-staff for a thirty-day period. The assassination of President John F. Kennedy was the first presidential death following the proclamation, making Kennedy the first for whom the month of mourning was observed. Additional information about what the American flag symbolizes can be found here. 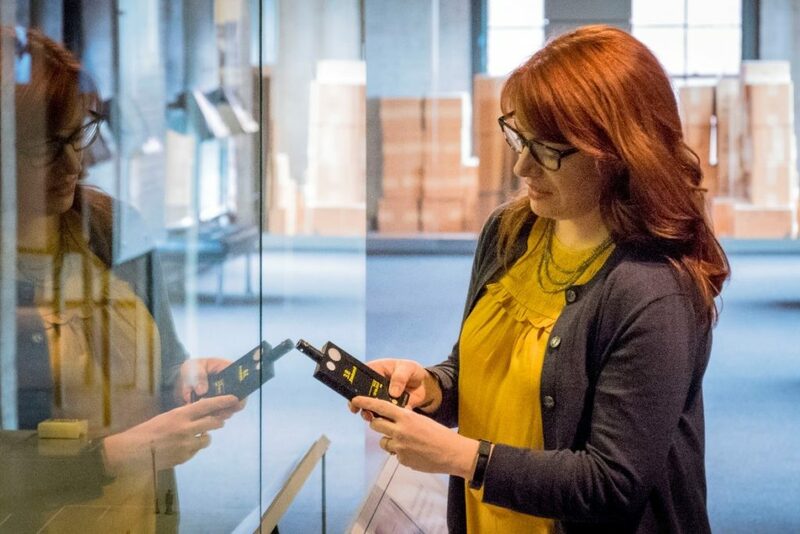 Once every ten years, collections staff at The Sixth Floor Museum conduct something called a “wall-to-wall inventory” – it’s a way for staff to account for every item in the Museum’s permanent collection. In 2016, the Museum received a Museums for America grant from the Institute of Museum and Library Services (IMLS) to help fund such an inventory. Intended to be a three-year project, the Museum started its latest inventory project in October 2016. Our Curator of Collections, Lindsey Richardson, oversees the project. Her first step was to hire two full-time Inventory Technicians – Anne Hanisch and Jennifer Browder. This is the team that will carry our project through from start to finish. A wall-to-wall inventory is just what it says: a count of every single collections item in the Museum’s storage spaces. 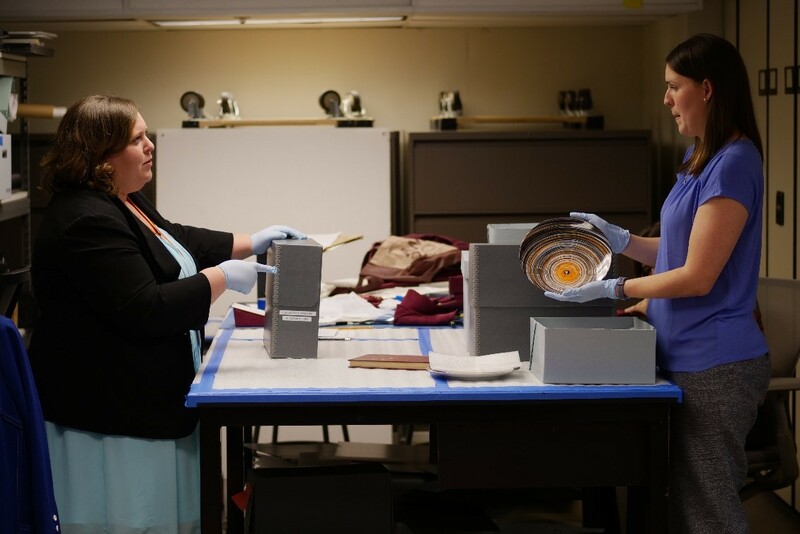 “Inventory is an important standard in museum collections management because it helps maintain intellectual control over collections,” says Lindsey. “The collection is already really well-organized. There are at least 50,000 items, and we expect that number to increase as we go. This year alone, we have inventoried 15,000 items,” adds Anne. Caption: Anne Hanisch (left) and Jen Browder (right) inventory items at The Sixth Floor Museum at Dealey Plaza. 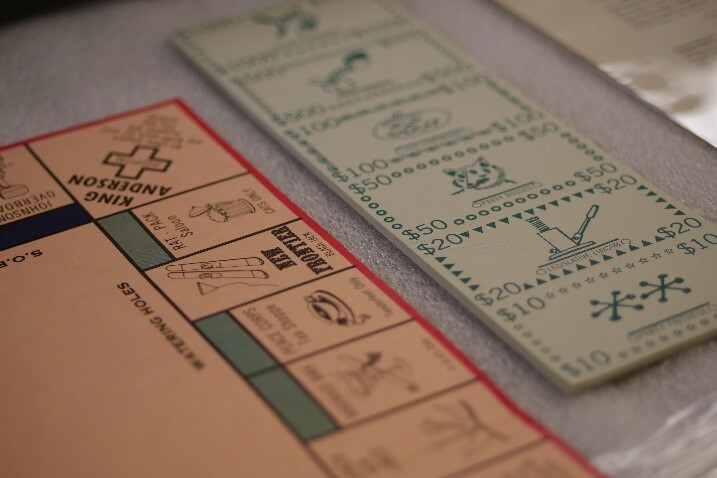 Caption: This board game from the 1960s comes with many parts such as dice, cards and playing pieces. Jen and Anne inventoried every single part associated with the object. This type of detail-oriented work can be difficult, but Anne and Jen are up to the challenge. The goal for the three-year project is to account for every item in The Sixth Floor Museum’s collection at every location where collections are stored. The team has already made great progress and other members of the collections department are happy to see the connections made between collections items and the improved quality of data for items already inventoried. Both Jen and Anne are familiar faces at The Sixth Floor Museum. Anne previously worked in the Museum Store + Café, and Jen interned at the Museum while she was in high school. They both knew that they wanted to end up working in collections, and their degrees in history and museum studies have prepared them for the work they are doing at the Museum. They’re happy that the work they’re doing over the course of this three-year grant will have such a large impact. Caption: Anne examines documents from The Sixth Floor Museum’s collection. 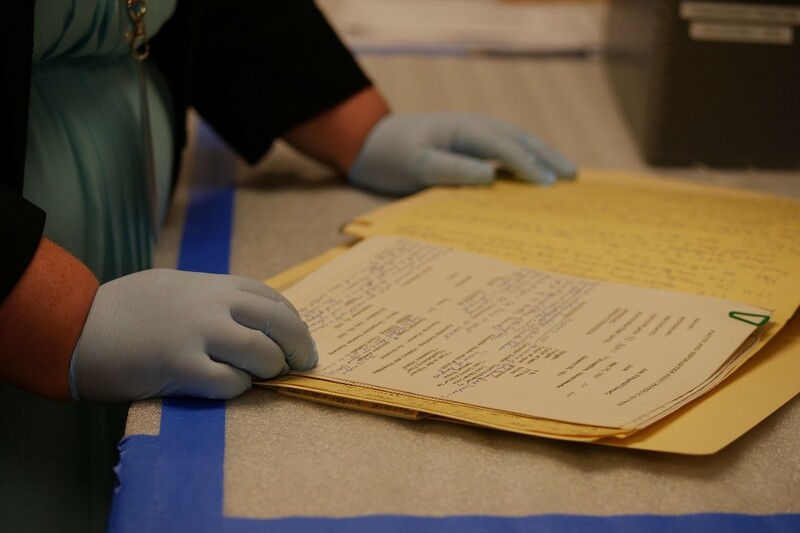 For the next two years, Jen and Anne will continue to work toward ensuring our collection is completely inventoried, with accurate data and archival, well-organized storage. And if you’re wondering about all the interesting objects they get to inventory, they love that part of their job, too. “The coolest part about our job is we will get to handle every single one of those objects. So, it’s a large task, but it’s a very important task,” says Jen. Anne says it’s super-exciting to be working on an IMLS grant, especially for self-proclaimed history nerds like themselves. They wouldn’t want to be doing anything else. This project was made possible in part by the Institute of Museum and Library Services MA30-16-0215-16. The views, findings, conclusions or recommendations expressed in this article do not necessarily represent those of the Institute of Museum and Library Services. Many visitors express curiosity about what goes on behind the scenes at The Sixth Floor Museum at Dealey Plaza, and this new series, “The Sixth Floor Museum: Behind the Scenes,” was created to answer those questions. It takes a lot of hard work and daily attention to every detail to protect and preserve the 50,000+ objects in our collection. From a multitude newspaper clippings to the recognizable Hertz sign formerly atop the Texas School Book Depository, there’s a myriad of exciting, interesting and unique items. The care of these objects is varied as well, and our Collections staff is up for the challenge of looking after a large array of objects. A number of items are on loan to the Museum, and the staff cares for these objects just as if they were our own. One such object is the FBI model, on display on the sixth floor. Owned by the National Archives and Records Administration (NARA), the FBI Model is on long-term loan to The Sixth Floor Museum, where it has been on display since 1995. The model was built by the FBI in 1964 to help investigate the Kennedy assassination and was also later used by the Warren Commission and the House Select Committee on Assassinations when they conducted their investigations. There are very strict conditions, especially regarding lighting, for this special object and the Museum is diligent about ensuring these conditions are met. 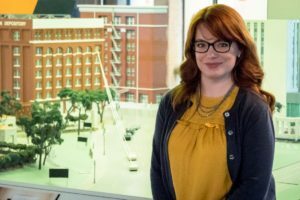 Abigail Aldrich, Exhibits Conservator at NARA, stands in front of the FBI Model at The Sixth Floor Museum at Dealey Plaza. Recently, Abigail Aldrich, Exhibits Conservator at NARA, stopped by to assess the condition of the model. Aldrich says that one of the most interesting things about the FBI Model is that because it was developed specifically to assist with a criminal investigation, it was not built to last forever. For example, the shrubs and trees in the model are made with natural sponge, which is very fragile. Over time, tiny pieces might start to come off. Aldrich says this can’t be totally avoided, but meticulous care can help slow the aging process. Aldrich uses an environmental monitor to check light and humidity levels in the FBI Model’s display case. As a part of her assessment, Aldrich performed what is known as a “condition check” on the FBI Model. To do this, she compared the model’s current state to what was previously noted by NARA, checked for areas of concern and ran numerous tests. Light levels, temperature and humidity are monitored to make sure that those levels meet the exacting standards NARA sets in place for all objects on loan. Aldrich says that though she expected there to be significant change since the last time NARA checked the object, she was impressed by its overall condition. The FBI Model is encased in special UV-filtered glass that keeps as much light as possible out of its case without obstructing one’s view of the model. To help prevent damage from light, the Collections department monitors surrounding light levels with both an environmental monitor and a light reader installed inside the FBI model case. If testing reveals that levels are incorrect, staff adjusts the model’s exposure to light sources. Sometimes, this means removing or rearranging light around the case. Very little about the model’s condition has changed since the last time it was inspected by NARA. That’s a testament to The Sixth Floor Museum’s commitment to preservation and to the strong working relationship between NARA and our Collections staff. Now that our new exhibit, A Time for Greatness: The 1960 Kennedy Campaign, has officially opened, it’s time to relax (just a little!) and take a look back at the installation process. While the few weeks prior to an exhibition opening are a flurry of activity in the gallery, the work of installation planning begins long before any walls are built or artifacts are installed. Early on in the development of this exhibition, staff from the Curatorial and Collections departments began formulating a concept for A Time for Greatness, determining the “story” that would be told through artifacts chosen from our collections, text and video. 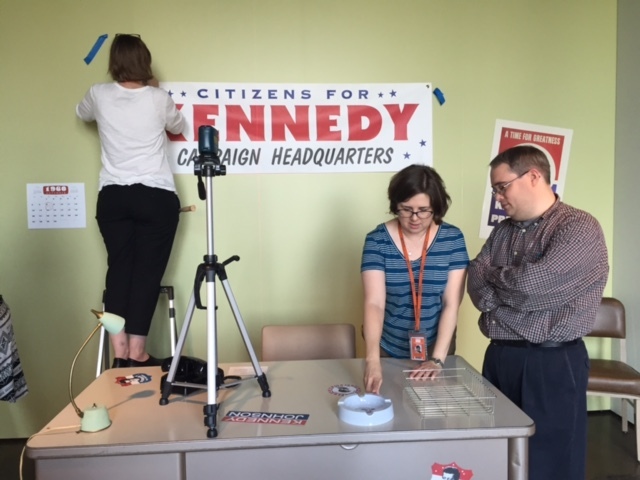 For this exhibit, which focuses on John F. Kennedy’s 1960 presidential campaign, we also wanted to provide visitors with an interactive experience and the concept of an interactive mock Kennedy Campaign Headquarters was born. Collections Manager Katie Womack installs a classic photo. At this point, collections items were also being selected for the exhibition and space planning was beginning to take place. Figuring out where to put the walls and making sure there are enough space to accommodate everything we wanted to display–especially in a 1901 structure with columns and windows everywhere–can be a challenge! After many sketches, discussions and a morning spent applying tape to the floor to mimic the wall configuration, we finalized the layout. We also needed to plan for and prepare collections materials for display in the gallery. All of the campaign posters needed to be framed and several also required conservation treatment. Small objects and magazines would need to be displayed in cases; for this show we had some cases fabricated and some were generously loaned to us by our friends at the Amon Carter museum. Other items, such as a group of campaign pins, were carefully installed by staff in a shadowbox frame. 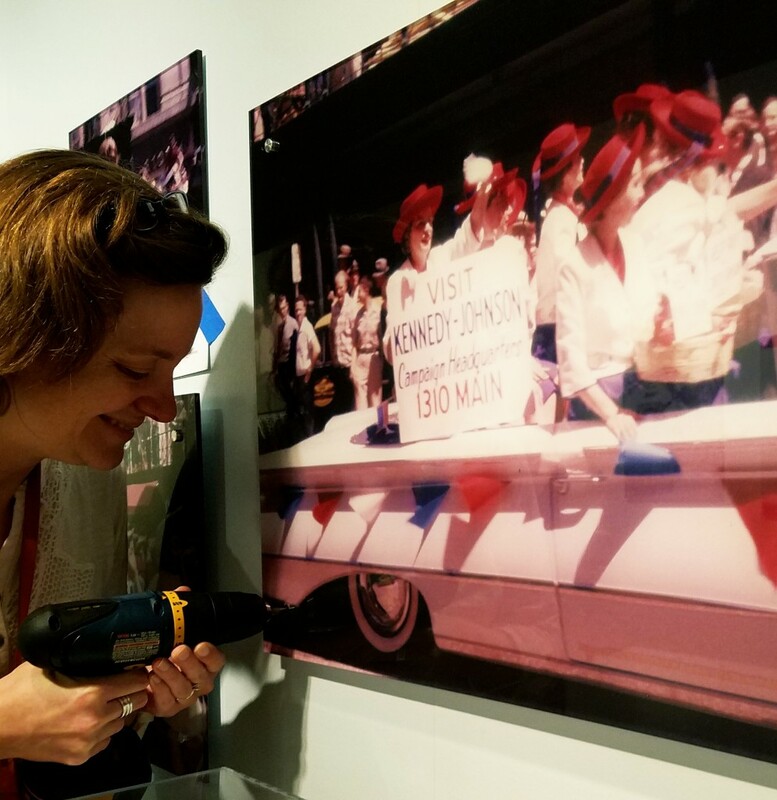 Staff used archival materials to construct mounts for items such as bumper stickers and magazines and we devised a plan to hang an original, 11-foot-long(!) 1960 Kennedy-Johnson banner using rare earth magnets. Photographs from Kennedy’s September 1960 campaign stops in North Texas were reproduced at varying sizes and images of collections items were used in text panels. Once our amazing Operations team built the walls in the gallery, we were able to get in the space and start working! First on the agenda was the interactive Kennedy Campaign Headquarters. It was so much fun to move the vintage furniture and office accessories we had purchased especially for the exhibit into the gallery and see that part of the exhibit transform into a little slice of 1960. It’s been so cool since the exhibit opened to see so many fun photos of visitors “working” at Campaign Headquarters! The week before the exhibit opened we worked with fine art handlers to move the pedestals into place, hang the campaign posters from the collection, install artifacts in the pedestals and hang the text panels and photographs. After getting the video portion up and running and doing some last-minute paint touch-ups, the show was finally ready. Our team worked so hard on this new exhibit and we could not be more proud to show it to you! Come see A Time for Greatness for yourself and share your pics from Campaign Headquarters and meeting Kennedy on the campaign trail using hashtag #JFK1960! Learn more about the exhibit and upcoming exclusive exhibit programming at JFK.org/ATimeForGreatness.